Draughts was always my favourite board game, because I could beat my father at it. When one of our pieces successfully outmanoeuvred the opposition to be "kinged", we always announced 'King-Thing!' in a sing-song voice. 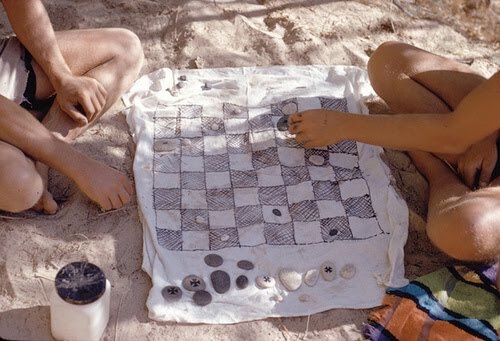 I like to imagine these young men are having a quick game of draughts at the beach, rather than a long, drawn out chess ordeal. Chess has no place at the beach. Draughts however, would be a good way to pass half an hour or so between having your bbq lunch with a draught of cold drink and having your second swim.